“O glorious wonder! The length and height of the cross is equal to heaven!” (3rd stichera for end of matins). 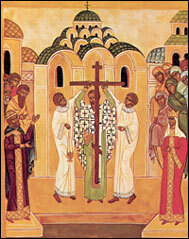 In lauding the Life-giving Cross of the Lord with these words from one of its hymns for the feast of the Elevation of the Cross, the Holy Church presents to us one of the aspects of its teaching on the Cross, namely: that the length and the height of the cross are equal to heaven; in other words, that the cross covers the entire universe, all of creation, the entire physical and metaphysical world. We find a unique exposition of this teaching in a wonderful book by the prominent Russian religious philosopher Prince Yevgeniy Trubetskoy, which deals with the issue that is reflected in its title – “The Meaning of Life.” The book was written in 1918, precisely at a time when the old Christian world was being demolished, and a post-Christian, apostate, apocalyptic era – the so-called New Age – was being established on earth. “An eternal argument of two opposing concepts of life rages around the question of the purpose and meaning of life – a naturalistic concept, which looks for real life and its meaning in the plane of this world, and a supernatural concept, which asserts that true life and its meaning is concentrated on a different, higher, otherworldly plane of existence. An examination of these two resolutions leads us to conclude that both of them are equally one-sided and thus equally invalid. For naturalism – both religious and philosophical – real life is precisely this life, which unfolds on this particular plane of existence; the real world is the one which revolves before us here on this plane, periodically dying and being reborn. A vivid example of such a concept of life are the ancient Greeks with their cult of nature and its sunny gods – the Olympians. All these gods of thunder and lightning, sea waves, moonlight, and the blinding light of the noonday sky are human-like personifications of the joy of life on earth. Greek religion also knows the hereafter, but it is not so much the other world as the underworld, where everything is gloomy and barren; Achilles’ shadow speaks of it to Odysseus, saying that it is better to be a slave on earth, than to reign over the dead in the kingdom of shadows. The pathos of Brahmanism is also tied in with the practical requirement that a person reject all individuality, all egoistic desires, all striving for a reward either here or in the beyond. This entire world is a lie – therefore, the meaning of life is attained only in a total disassociation from the world. For Brahmanism the ideal of life is a complete dissolvement of all that is individual and concrete within the impersonal unity of a universal spirit. This ascetic disassociation from everything is crystallized in Buddhism, whose ideal consists of rising not only above a finite individual life, but above all life in general, above all striving towards life, above all desire for immortality. Buddhism leaves without reply the very issue of an individual’s eternal life, in order not to awaken in man that vain desire for life which lies at the root of all suffering on earth. A peaceful immersion into the “nirvana” preached by Buddhism is achieved through complete disassociation from life. In the final analysis, however, the religious quest here also remains unresolved. India’s ascetic self-abnegation turns out to be a half-truth just like the religious worldview of the ancient Greeks. We see here two opposing aspirations to life, two intersecting lines of life. One establishes itself here on earth, has both ends firmly entrenched in this world. The other, on the contrary, yearns away from the earth, aspires upward. But in a fatal manner both these lines lead to one and the same. Both the Olympians’ transient exhilaration with life and the lofty flight of Hindu asceticism end in death. For that which is deemed to be bliss in Brahmanism and Buddhism is, in reality, not the victory of life but just the opposite – victory over life and, consequently, the victory of death. Hindu religiousness essentially believes not in the meaning but in the meaninglessness of life. The Hindus engage in a spiritual ascent, but it ends in fatal failure, for in their religion the spirit does not animate the world, does not transform it from within, does not vanquish the force of evil in it, but only delivers its own self from this force. The Hindu spirit’s attitude towards earth is exclusively negative: it disassociates itself from earth forever and thus gives up the earth and all the living beings on it into the power of suffering, evil, and futility. The suffering of all living creation is futile and its hopes are in vain, for it has no place in the salvation proclaimed by the ascetics of India: their “salvation” is not the salvation of life, but rather salvation from life; the ascetics’ “salvation” lies precisely in the destruction of all concrete forms, all variety of creation… Thereby the ascent into the beyond, which constitutes the essence of India’s religious aspiration, turns into nothingness, for this ascent does not lead to its goal, and heaven itself remains forever closed to them, forever beyond their reach. Both the Hindu and the Greek solutions to the question of the meaning of life turn out to be equally invalid. In affirming the world Greek religiousness finds chaos instead of the cosmos, finds a multitude of forces battling each other, not joined by the unity of a common meaning, while Hindu religiousness completely rejects the world as nonexistent and nonsensical, i.e. finds meaning only in its destruction. Thus, whether man seeks the meaning of life in the horizontal earthly plane or in the vertical ascent onto a different plane of existence, the result of these two movements is the same: suffering over unattained meaning and the return of the circle of life back to earth, to futility. Both these lines, which express the two basic directions of life’s aspiration – the flat or horizontal line and the ascending or vertical line – cross each other. And in view of the fact that these two lines represent a comprehensive depiction of all possible directions of life, their intersection – the forming of a cross – is the most universal and exact schematic depiction of the path of life. In every form of life there is an inevitable intersection of these two paths and directions – the upward movement and the forward movement. In this sense the cross lies at the base of all life. The outline of life itself is cruciform in nature, and there is a cosmic cross, which expresses the architectural foundation of the entire universe. In other words, we must seek the meaning of life not in a horizontal or vertical direction taken separately, but in the unification of these two lines of life, in the place where they intersect. In the true meaning of life all suffering must be vanquished and transformed into joy – both the physical suffering of earthly creation and the spiritual suffering of an unsuccessful ascent into heaven. The meaning of life is tested by the cross, because, in the final analysis, the question of life’s meaning is the question of whether the cross – a symbol of death – can become the source and symbol of life?